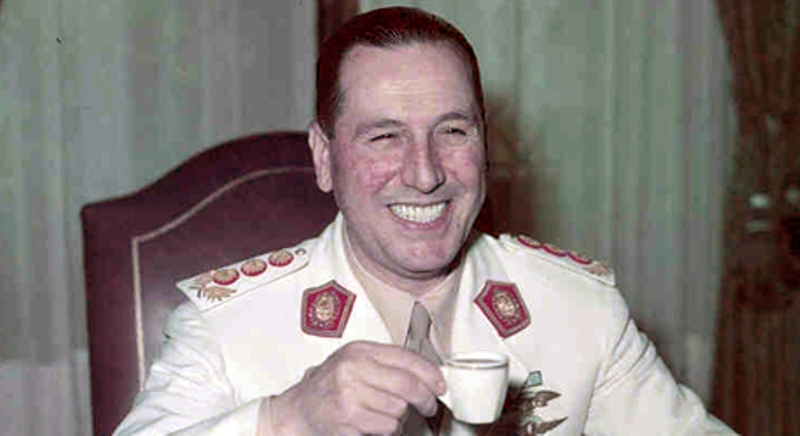 Juan Peron, circa 1945. Photo via Wikimedia Commons. Juan Peron must not be mistaken for just another Latin American dictator with a nickle-plated personality and an ironclad conscience. He is providing safe haven for a band of international bankers, munitions makers, cartel directors, and war-mongers who have transferred their headquarters from the former Axis capitals to Buenos Aires, together with their fortunes, formulas, and blueprints. At home Peron is supported by an armored police force as powerful as the army, by the Catholic church, and by the political caudillos who for sixteen years have counted votes their own way, or never bothered to count them…. Since then Peron has been boss. Deftly he maintains his power and plays off his enemies against one another. He has flirted with capital and labor, with the moderates, the conservatives, and the leftists, and all along has been in close contact with the Nazis…. Today, with mutiny still festering in the army, and the country threatened with civil war, Peron is determined to remain ruler of Argentina. He has risked his life many times in the past forty years to get within striking distance of his goal, and I do not think he will be removed alive.